It has been a very long time since I have read a book I have enjoyed as much as A Crack in Creation. The voice Doudna projects through the pages was not at all what I would have expected from such an accomplished scientist. In fact, her manner of story-telling rivals many actual novelists. And, naturally, the science was interpreted and condensed exceptionally well. Dr. Doudna is known in the scientific community as one of the researchers who discovered and described CRISPR/Cas-9, a rapidly expanding tool used to edit genomes. I first heard of CRISPR when I was TAing a genetics course at my university 3 years ago. This technique is extremely new, only really coming into use within the current decade. However, the possibilities it imposes for scientific advancement and gene editing are unheard of. In fact, a description of it seems to be straight out of science fiction. Until recently it was difficult, if not impossible, to accurately control any method that could change genetic sequences. We could insert genes or letters into DNA, but it wasn’t very exact and in many cases random. But not with CRISPR. Think about that for a second. CRISPR could conceivably cure any genetic abnormality. Let me repeat that. Cure, not treat. This would include things like HIV, cancer, Huntington’s, the list is endless. I am not alone in feeling that this tool can change the medical industry forever. 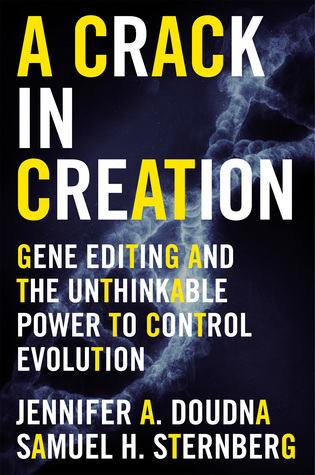 This novel covers not only the possible medical ramifications of CRISPR, but also the history behind the discovery and research that went into the development of CRISPR as a tool. Additionally, Doudna discusses the ethical implications. As exciting as CRISPR is, the thought of how it can be abused is equally terrifying. I found it humbling and reassuring to see that Doudna shares the same concerns. By the end of this novel, I was left with a great feeling of inspiration and renewed confidence in the scientific community. Doudna weaves her message to scientists through the pages, insisting that science should not be done in isolation, and that communicating with the public should be a priority, because the future does not belong to scientists alone, but the citizens as a whole. Science should be an open discussion, and this novel provides a fantastic step towards that. As a woman in science and a public advocate, Doudna is an inspiration to young scientists, and her authorship in this captivating novel only secures her a place as one of my role models.